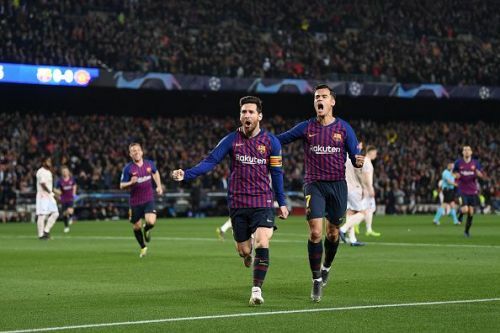 Barcelona beat Manchester United 3-0 in the second leg of the UEFA Champions League Quarter finals. The home side won 4-0 on aggregate. Phillippe Coutinho scored one while Messi scored a brace for the Blaugrana. Fans on Twitter couldn't help but praise the Argentine genius. In the first half, Manchester United started very well and Marcus Rashford hit the post in the first minute of the game. That was a huge chance which United should have put away. Then Barcelona settled into the game and kept pinging the ball about until Ashley Young lost the ball in his own half. Thereafter, Messi nutmegged a United player before curling an effort into the bottom corner in his typical style. The second Barcelona goal was a howler by David de Gea after Messi took a shot with his right in more hope than zest and it rolled past the Spaniard into the back of the net. After that, it was all Barcelona until the end of the first half. Coutinho had another opportunity just at the stroke of half time when Messi pulled off one of his trademark runs from midfield before finding Jordi Alba who smacked a low ball into the box only for Coutinho to find David de Gea. Manchester United needed something extraordinary in the second half to pull this comeback off and they started pretty tentatively in the second half. Barcelona were still dominating the ball and creating chances. Messi was playing at his very best and he was leaving all United defenders guessing which move he would make. In the 61st minute, Phillipe Coutinho curled one of his trademark shots into the back of the net. It was one of those goals which we were used to seeing in his Liverpool days and it was spectacular. That made it 3-0 on aggregate and after that, it was all about United avoiding a drubbing. Manchester United kept hold of the ball for a couple of minutes but they just weren't able to create much on the day. In the end, Barcelona held on to their lead and won the tie 4-0 on aggregate and progressed into the semi-finals of the Champions League. Here's how Twitter praised Messi's genius. #Messi ...."the Mozart of our game. The rest? Banjo players."